At this point in the 2015 television season, the idea that audiences must face yet another potential character death is exhausting, to say the least. It is made doubly so by the fact that answers to the question of Felicity's survival will have to wait until next year. Sure, next year is just a few weeks away, but after a year in television where characters were stabbed by their oath-swearing brethren, turned into a human chafing dish for the undead's mid-afternoon buffet, and sent to the underworld after downing a cup of poison, the latest character-related development on Arrow feels like a trend on the verge of overkill – and that's not necessarily because Damien Darhk sent a squad of heavily armed goons after one mayoral candidate in a limousine. All this isn't to say Arrow's midseason finale doesn't deliver the goods, or Felicity's life hanging in the balance doesn't make for compelling television – now or when the show returns in January. It is and it does. It is just that, if Arrow is going to be entering into these familiar waters, it would be well served by attempting to tread them differently than those who came before it have. Still, even with the cliffhanger ending, 'Dark Waters' manages to be a strong episode for the series to end 2015 on. For the most part, it is a surprisingly restrained hour of television that perhaps cheekily relies on the "previously on Arrow" introduction to ready viewers and have them on the lookout for potential signals that would indicate someone on Team Arrow is about to take a dirt nap. In fact, much of the episode seems designed to take that one idea and run with it, making certain that nearly every character interaction reads like the last time those two individuals will see one another. Diggle gets a little too close to his unrepentant brother on more than one occasion, making it seem possible for him to be on the chopping block. Laurel has a heart-to-heart with her father in her full Black Canary ensemble, while Lance and Felicity's mom go semi-public at Oliver's campaign's holiday party. Everything feels like a tragedy waiting to happen, which actually works wonders for the hour. As mentioned above, 'Dark Waters' is a relatively restrained episode in its early going. Yes, there's the drone attack on the beach that is seemingly destined to put a black eye on Oliver's run for mayor, but the incident, like the deceptively muted tone, winds up taking the plot down a more interesting-than-expected path. For one thing, it builds a tremendous amount of tension. Viewers are already keyed in to the prospect of a character dying, so for the episode to almost deliberately play that tension down, going so far as to enter into a semi-comedic subplot about Donna finding the engagement ring and Felicity wondering aloud why Oliver hadn't proposed, actually makes the anxiety of someone possibly being taken out all the more intense. But there was something else on display throughout the hour that actually spoke to the lessons the series likely learned after last season. 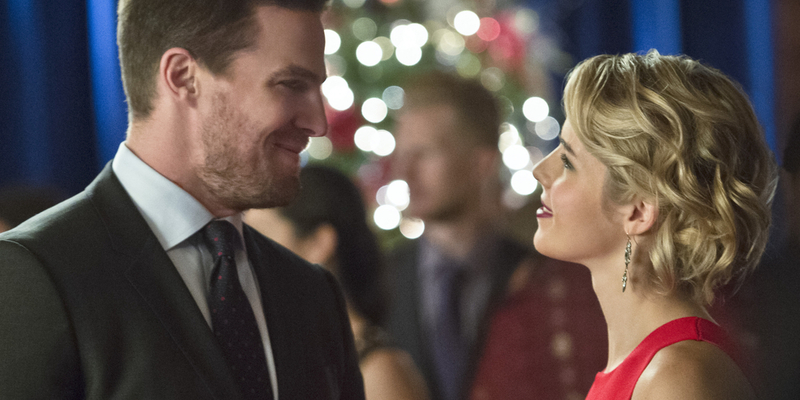 Arrow has found a way to incorporate Oliver's tendency to backslide toward certain bad habits into the efforts that have been made to lighten the series' tone. When Oliver is faced with circumstances that might otherwise see him choose to shut everyone out and become a secretive, brooding mess, he instead turns to those who can help him in his hour of need. This not only leads to Malcolm Merlyn using the greatest explainer of all time with "I'm Ra's al Ghul," it also leads to the would-be destroyer of Star(ling) City donning the Green Arrow's costume in an effort to maintain Ollie's secret identity. While it's kind of cool seeing Malcolm in full Green Arrow gear, the effort works to send a much clearer message of just how much Oliver has changed since last season. Oliver's discussion with Laurel operates in much the same fashion. There's none of Oliver's typical lecturing present; instead there is only the kind of interaction one would expect between teammates. That doesn't mean there isn't plenty of the old Arrow around, though. Director John Behring throws in a short but brutal montage of Oliver taking out Damien's goons in an effort to learn where his friends and family are being held captive. This is the sort of sequence you could easily see being the first thing to go when it came time to edit the episode, but by keeping it in, and making such a point of the degree to which Oliver's ferocity and tenacity can rule him, it makes the character's decision to accept help when it's offered feel like a real sign of growth. Of course, all of that just makes the potential of Felicity's death all the more devastating (if not expected). The moment it seems as though Oliver has indeed grown into a more open and mature person – as well as hero – circumstances arise that threaten to change not only what he has become, but also what he might become, should he have been able to maintain the path he's on. If Felicity really is the body in that grave – and at this point it's still a big "if" – that could have far-reaching implications for Oliver and also the series, either setting them both down a darker, revenge-driven path, or doubling down on this new, mature Oliver doing something unexpected and continuing to keep fighting in the light. Whatever transpires when the series returns in 2016, Arrow will find itself in an interesting place. 'Dark Waters' may have been guilty of playing around with the audience's expectations, teasing a number of possible victims, but it also made sure to showcase Oliver and Felicity's relationship and to demonstrate why it has worked so far this season. Oliver is changed because of that relationship, but he's also changed because of the show's obligation to present the character as having moved forward in both aspects of his identity. Not only does this lead him to take a major step by proposing to Felicity, but it also means, should the unthinkable happen, it will be a very different Oliver who faces such an incredible obstacle.